The flowers of November are seen in November Botanical tapestry, based on the originals of Robert Furber. From the late autumn month of November, this work is from Twelve Months of Flowers, a work from 1730 which in exquisite detail, shows 30 species of flowers per month, for every month and therefore season of the year. Here we see a variety of blooms in a delectable variety of colors, from reds to yellow, to pinks and deep blues. The Greek or Roman styled vase is also seen, as the flowers and leaves fall onto the ornate ledge below. These tapestries showing the wonderful works of Furber bring beauty and color to any room or home. 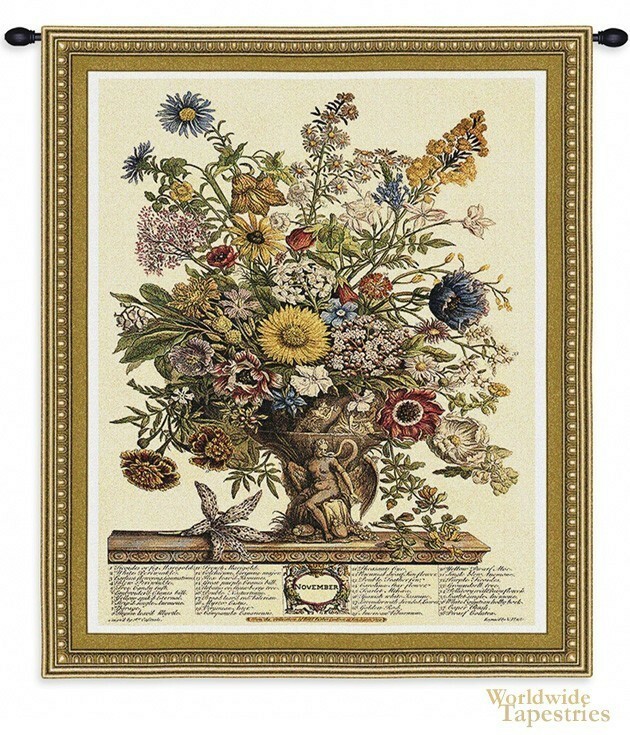 November Botanical tapestry has a lining and a rod tunnel for easy hanging. Note: Tapestry rod and tassels, where pictured, are not included in the price.